GR Piccolo Trumpet Mouthpieces and Adapters are being played by many of the world's premiere trumpet soloists. Featuring a huge open resonant sound, and a crisp centered core, GR Piccolo Trumpet Mouthpieces are quickly becoming the equipment of choice from major symphonic players and church soloists to serious students. Our GR Piccolo Trumpet "System" is the most versatile Piccolo Trumpet set-up on the market. Where else can you "dial in" the perfect rim, cup, and blow resistance to perfectly match your horn, leadpipe, or musical situation? Right...only with GR! GR Piccolo Trumpet Mouthpiece Rims feature contours very similar to our Standard Rims. This rim is comfortable and is easy for most players to adapt to quickly. The width will feel generous and will aid endurance. The bite radius has been increased to give the feel of a larger mouthpiece while keeping the buzz ring smaller. They are slightly wider than our Standard Rims for support in high piccolo trumpet playing. Flexibility is good yet attacks will not suffer. The 64.4P and 66PM-T have a sharper bite than standard. An ideal mouthpiece for extreme upper register and light piccolo work. This is an excellent choice for use on pieces such as the Brandenburg Concerto. This cup is a good choice on less resistant piccolo trumpets and for players that do not use much lip engagement. The sound is light and brilliant. This is an excellent all around piccolo mouthpiece cup. This mouthpiece produces a beautiful characteristic piccolo sound. Also ideal for extended upper register work for players who tend to bottom out on small volume cups. This cup has a very large volume for a piccolo mouthpiece and is very free blowing. It is used for all types of piccolo work from the Brandenburg on the Bb side to D trumpet parts using the A side. It is recommended for experienced piccolo players with very strong embouchures, more resistant piccolo trumpets, and players that use a lot of lip engagement. A flatter rim with a medium sharp bite. The cup is very efficient and versatile. This mouthpiece can be used in a large variety of musical situations. 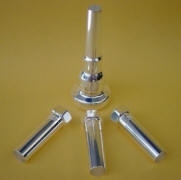 GR Piccolo Trumpet Mouthpieces are standard in a Cornet Shank with a specially designed #3 Piccolo Trumpet Backbore.